B.H. Industrial Services Pvt. Ltd. Processed and purified with the latest Reverse Osmosis and Ultra Filtration technologies. 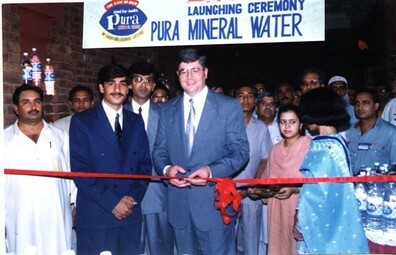 PURA Mineral Water comes in PET bottle of 0.5 liter and 1.5 liter with 28 mm neck size. Blue Gold Mineral Water comes in packings of 1 liter PET and 19 liter PC bottles. Launching ribbon was cut by our associate Mr. Dennis James Hannon of Detroit, MI, USA. Setting the standards of purity and taste since 1994. For Purchase Inquiries, please Click here. Bottled water taken from natural aquafer, with no minerals added, and containing not less than 250 parts per million total dissolved solids may be labeled as mineral water. Mineral water is distinguished from other types of bottled water by its constant level and relative proportions of minerals and trace elements. If the total dissolved solids (TDS) content of mineral water is below 500 ppm, or it is greater than 1,500 ppm, the statement "low mineral content" or "high mineral content," respectively, must appear on the label. If the TDS of mineral water is between 500 and 1,500 ppm, no additional statements are needed. In Europ, all Natual Spring Waters with a TDS of 0 to 500 mg/liter are considederd Mineral Water with Low Mineral Content (or just mineral waters). Almost all human cells have some level of magnesium in them, and adults need 300 to 400 milligrams of magnesium every day. Magnesium is important for the regulation of muscle contractions and the transmission of nerve impulses, and it activates energy-producing enzymes. Bone structure also relies on magnesium, and it expands blood vessels, which lessens the risk of heart attack. Nervousness, lack of concentration, dizziness, and headaches or migraines may result from magnesium deficiency. Most bottled waters have below 20 mg/l of magnesium, though some may have as much as 1000 mg/l. Adults need about 800 milligrams of calcium per day--babies don’t require as much, but fifteen to nineteen year olds need significantly more. The many benefits of calcium include stabilizing bone structure, teeth, and cell membranes; ensuring nerve and muscle impulses are properly transmitted; and helping to prevent blood clotting. Calcium also has a balancing effect for numerous skin allergies. Bones decalcify (osteoporosis) and fractures become more likely if a body is not getting enough calcium. Bottled water usually has less than 100 mg/l of calcium, but a few examples have about 500 mg/l. 2 to 4 grams is usually a sufficient day’s supply of potassium. Children and young people should pay particular attention to their intake, since potassium aides the growth of cells. The pressure of water between cells is regulated by potassium, which also makes sure each cell gets enough food. Potassium has special roles to play in muscle contraction and the formation and conduction of impulses of the heart. Potassium deficiency can weaken skeletal muscles and make smooth muscles tired. Typical potassium content in bottled water is less than 5 mg/l, though some European brands have as much as 50 mg/l. A person’s level of exertion largely determines his or her daily requirement of sodium. Normally about 3 grams are necessary, but severe physical stress can bring the requirement up to 15 grams or more. The heart’s metabolism is affected by sodium, as is the regular contraction of the heart. We rarely have to worry about sodium deficiency: Salt is an integral part of many foods. Sodium in bottled water ranges from 10 mg/liter in most bottled waters up to 1,200 mg/liter in a few European waters. Sulfates are the salts of sulfur. They aid the liver in detoxification and help digestion by stimulating the gall bladder. Sulfates in high doses act as a laxative. Fish, meat, and milk contain sulfates, which are an important component of protein. The human body only absorbs small amounts of sulfates, but these amounts are sufficient to stimulate peristalsis by binding magnesium and sodium to water in the intestine. Most bottled waters have well below 100 mg/liter of sulfates. Present in all biological fluids, bicarbonate is essential for maintaining our bodies’ pH balance. The substance is also found in stomach secretions. Lactic acid generated by physical activity is neutralized by bicarbonate dissolved in water; a similar process raises the pH of some acidic foods. The typical range for bicarbonate in bottled water is 50 to 200 mg/liter, some brands in the west have up to about 1,800 mg/liter. Most adults need between 20 and 30 milligrams of silica daily. [An essential mineral building block, silica is one of the body’s greatest energizing nutrients.] Silica reduces the risk of heart disease and may prevent osteoporosis; it also helps tissue repair by serving as an antioxidant. Hair and nails are strengthened by silica. If bottled waters contain any silica, it’s usually less than 20 mg/liter. The human body needs iron, iodine, copper, fluoride, zinc, and other trace elements as well as minerals. The recommended daily intake is fractions of a milligram for some substances and a few milligrams for others.